A view of Marshall, N.C., headquarters of the French Broad Electric Membership Corp., across the historic French Broad River. Boone, N.C. — A program that pays for the upfront cost of home energy improvements could lower monthly bills for thousands of families in western North Carolina while creating jobs, strengthening local economies, and protecting natural resources and public health, according to Appalachian Voices, a regional nonprofit organization based in Boone. 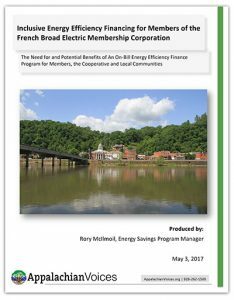 The organization released a report today that focuses on the French Broad Electric Membership Corp. service area, which serves all or part of four counties in western North Carolina and two counties in East Tennessee. It examines the housing characteristics, poverty levels, and the portion of household income spent on energy bills, as well as the multiple benefits that would result from making the area’s homes more energy efficient. As many as 11,000 households that are members of the French Broad cooperative need energy efficiency improvements such as insulation and new heating systems. If the co-op implemented a modest “on-bill” finance program available to residents of all income levels, regardless of whether they own their home, participants could save $1,000 or more over 10 years, and more than $500 a year after that. Given that one-fifth of all area households live in poverty and spend more than 20 percent of their income on energy costs, such savings could prove critical for thousands of families. Additionally, the organization estimates that the program would save French Broad an average of more than $100,000 a year on demand costs — savings that benefit all co-op members by helping keep rates low. It could also result in millions of dollars in local investment each year and create more than 60 jobs. Within the past two months, the Yancey and Mitchell county commissions in North Carolina have passed resolutions supporting on-bill financing, and Appalachian Voices has collected more than 20 letters of support from local organizations and businesses and more than 100 signatures from French Broad co-op members. Appalachian Voices recommends that supporters of on-bill financing or residents who want to participate in such a program get in touch with their electric utility and ask them to consider developing an on-bill finance program. “This is a problem affecting communities all across the two states, meaning there are likely hundreds of thousands of homes that could benefit from a financing program that is accessible to families of all income levels. And the benefits to local economies would be tremendous,” said McIlmoil.